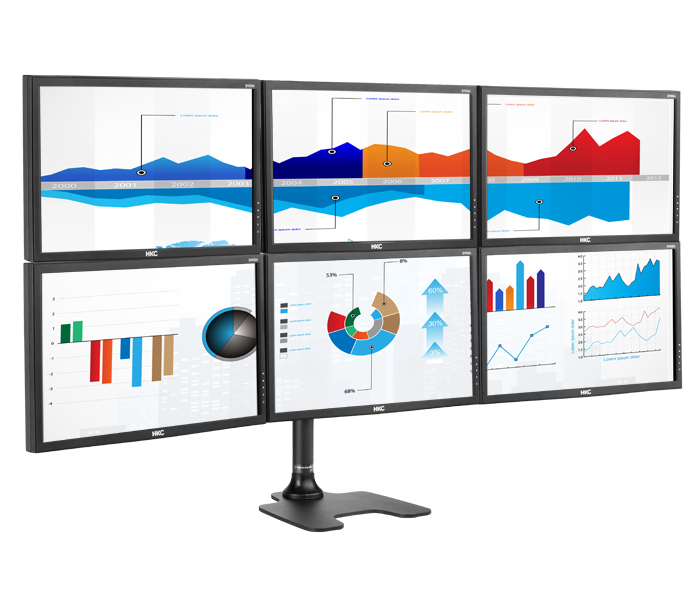 The Spacedec Freestanding Six Monitor Display Mount is designed to mount six 24” 17.5 lbs. monitors on either a freestanding low footprint base or via a bolt through mounting option (both included). It has been designed for quick and easy installation and set up. 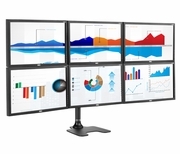 The Six Monitor Display Mount is an extremely durable mounting solution featuring a curved “cockpit” style configuration which provides superior ergonomic viewing and no-fuss, space saving operation. This fully adjustable and robust product is ideal for multi-screen users, particularly in commercial and “onsite” environments. Monitor height, tilt, pan and landscape to portrait rotation can be easily adjusted. This product also features outstanding cable management for neatly and safely housing up 12 0.3” diameter cables.